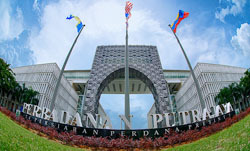 Perbadanan Putrajaya Building Complex - Malaysian Federal Government Buildings, Malaysia. Putrajaya near Kuala Lumpur in Malaysia houses 30+ federal government buildings. This is a high secured area and the government wanted to implement the Intelligent Building Management System which comprises of the Building Management System (BMS) and Facilities Management Software that integrates with the BMS to provide complete automation to the Facility Management (FM) Operations. PPJ was looking to have a portal integrated using which they wanted to manage all these buildings and its operations. Metronic Global Berhad, Malaysia - SIERRA's partner is a market leader in Malaysia in the Intelligent Building Management Systems (IBMS) chose to implement SIERRA's - eFACiLiTY® - Enterprise Facilities Management System that integrates with popular Building Management Systems (BMS) and provides all possible facilities management modules like Enterprise Asset Management (EAM) or Computerized Maintenance Management System (CMMS) or Computer Aided Facilities Management (CAFM) which is the primary module along with Helpdesk System with Knowledgebase, Visitor Management System, Facilities Booking / Reservation System, Tenant Billing System, Time and Attendance System, Mail Room Management etc. The eFACiLiTY® – Asset / Maintenance Management module picks up alarms from the individual assets in case of any mal–function via the Building Management System (BMS), generates work orders automatically and alerts the maintenance technicians / contractors over SMS and email. The eFACiLiTY® – Asset / Maintenance Management module manages all the assets present in these 30+ buildings, tracks their warranty / AMC contract details, their maintenance schedules, costs & budgets, break–down history, inventory related to the assets and their purchase orders etc. The eFACiLiTY® – Visitor Management System helps effective management of the front desk / security to screen the visitors, register, sign–in quickly and allow the visitor only to relevant areas via integration with access control devices and is very useful for managing the security of the government buildings.